In undulating flight the bird flew right over our heads. It landed on a tree ten feet away and started pecking hard, expanding a hole to about the size of a dime. Next it flew to the ground and picked up a nut from a local oak tree. In seconds the bird flew back to the tree and shoved the oak nut into the hole and pecked it so that the surface of the nut was flush with the tree. The bird had a bright red head feathers, which looked as if it were wearing a red yarmulke skull cap. It also had a black eye mask, and a white belly. It’s back was dark black and had an iridescent glow to it in the sunlight. 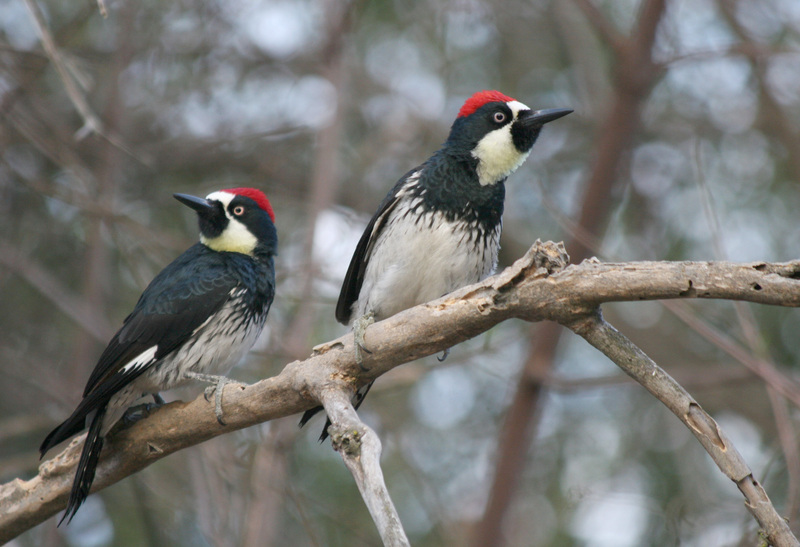 The bird was an acorn woodpecker and the location was Muir Woods, California. 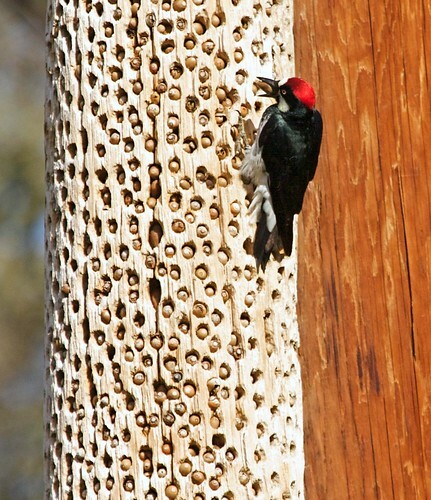 The acorn woodpecker is named for its favorite diet, which is stores in telephone poles, trees, snags, and walls, wherever it can dig a hole above the ground, away from the competing foragers. Appearing to have a clown-like face, this western woodpecker has a complicated social structure, living in small colonies. Best known for its habit of hoarding acorns, the bird drills small holes in a dead trees, and harvests the acorns in fall and stores them in these holes during winter. Forming their nuts in what is called a “granary tree,” the woodpeckers may use the tree for generations. And the tree may be riddled with up to 50,000 holes. The diet of this woodpecker, contrary to common belief is vast. This bird will eat almost anything of a certain size that moves. It is pretty much omnivorous. Acorns make up about half of annual diet, and are of major importance during winter. It also feeds on insects, particularly ants. Diet also includes various nuts, fruits, seeds, and sometimes eggs of other birds. 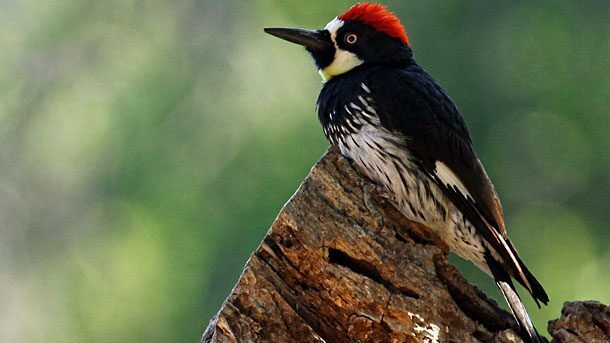 The Acorn Woodpeckers in Ashland, Oregon, are prodigious, as they have many trees along Lithia Creek that are pocked with their seeds for the winter.